Green Rubber-lined Clips have a M10 boss and are for pipe installation / management. 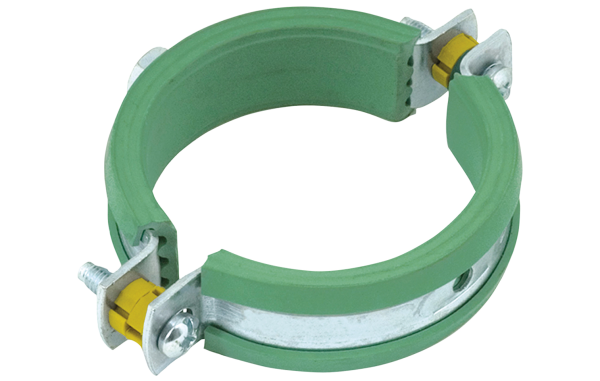 These two piece electro zinc plated pipe clips come with green EPDM rubber insulation for noise reduction, tested according to DIN 4109. The lining makes them suitable for applications with plastic pipes. The lining is smooth to allow for the sliding of the pipe in the clamp. Lined pipe clamps are available to suit common pipe sizes from 20mm up to 125mm. The clips have removable spacer washers, providing the option for either location or tight fixing. Available in common pipe sizes up to 125mm.